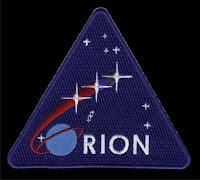 Although it's not publicly official yet, the name of our project to return to the Moon is Orion -- just like the original project was called Apollo, you know. 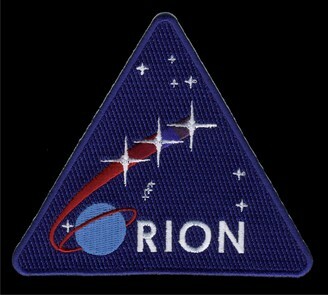 And Space.com has just published NASA's logo for the Orion project. ecstatically followed every flight of Mercury, Gemini, and finally Apollo. The first landing -- particularly sitting up late at night on my grandparent's floor watching Armstrong and Aldrin skip across the Moon in ghostly black and white -- is seared into my brain forever. It was something you just instinctively knew without question was an historical event. Now we're going back, and I have that old feeling again. I can't wait to see every new design, to hear every new iteration and refinement of our stratagy to return to Earth's grey satellite. Some people object to Orion because it is based too much on Apollo technology, or we should let private business do it, or because Mr. Bush thought of it. But my only objection is that we should have done this 30 years ago.